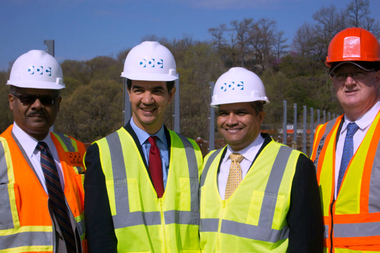 Councilman Ydanis Rodriguez (center left) and Department of Design and Construction Commissioner Feniosky Pena-Mora (center right) pose in May 2014 at the High Bridge, which was undergoing renovation. Pena-Mora hired Rodriguez's wife to be a special assistant to the commissioner at the DDC in June 2014. WASHINGTON HEIGHTS — Frustrated workers at the Department of Design and Construction raged at Mayor Bill de Blasio in a letter two years ago, accusing him of doing nothing after they warned him the agency's commissioner was hiring cronies, including the wife of a city councilman, DNAinfo New York has learned. DDC Commissioner Feniosky Pena-Mora hired Christina Melendez, the wife of Councilman Ydanis Rodriguez, as a special assistant to him with a $150,000-a-year salary in June 2014. Two years earlier, when Pena-Mora faced removal as the dean at Columbia University's engineering school, Rodriguez came to his aid, leading a campaign to keep him in the job. Melendez, who had previously worked in education, didn’t have a background in engineering or architecture, disciplines normally associated with the DDC. But the DDC position paid $48,000 more than her previous job as an assistant principal, according to city records. Pena-Mora's hires of Melendez and others shortly after his appointment as commissioner in April 2014 have fueled patronage allegations by DDC employees over the past two years, according to sources. Some staffers were so outraged that they wrote an anonymous letter to de Blasio complaining about the alleged patronage, the demotions of longtime personnel and Pena-Mora’s abrasive management style. When nothing changed, DDC employees wrote a second anonymous letter to de Blasio on Nov. 5, 2014, this time excoriating him for not acting on their warning. “You have greatly disappointed us Mayor,” the letter says. The letter, obtained by DNAinfo New York through a Freedom of Information Law request, was also sent to state and city regulatory agencies, including the state Attorney General’s Office and the city Comptroller’s Office. In the letter, the unnamed authors gripe that they had also reached out to the Conflict of Interest Board and the Department of Investigation. The letter names about a half-dozen individuals who, the unnamed authors believe, landed patronage jobs. In some cases, the letter says, new positions were created and responsibilities were taken away from accomplished employees. While the letter was written two years ago, DDC staffers who spoke to DNAinfo New York said that the ill will over Pena-Mora’s hires and demotions continues. One insider said Pena-Mora is unapproachable, spending much of his time sitting in his office with his lights off using his computer, rather than working in the open with his subordinates like the previous commissioner. The employees said that his belittling of some workers has led to the departure of dozens of longtime employees, including some managers with deep institutional knowledge. The DDC said in a statement to DNAinfo that the agency has nearly 1,300 employees and any transition under a new administration can be difficult, even when necessary. "The commissioner has worked tirelessly with the staff to create new programs within DDC to invigorate the entire agency with a renewed emphasis on project delivery and professional growth, particularly in the areas of staff recognition and employee engagement," the statement said. The statement also thanked Melendez for her work. She left the agency in April 2015 and took a lower-paying job with the city Department of Education. "Ms. Melendez was hired by DDC to assist the commissioner in the transition after the commissioner’s appointment," the DDC said in a statement. "We appreciate her service to the agency." The statement did not address questions about Pena-Mora's relationship with Rodriguez. Pena-Mora has amassed an impressive resume over a two-decade career spent mostly in academia. He earned a doctorate in civil engineering at MIT. Before coming to Columbia University, he was a provost at the University of Illinois at Urbana-Champaign. He was appointed dean of Columbia’s Fu Foundation School of Engineering and Applied Science in 2009. In spring 2012, he came under fire from faculty who complained he was expanding the school too quickly, giving professors too much work and that he was too focused on fundraising. As Pena-Mora fought to keep his position, a helpful ally emerged — Councilman Rodriguez — who held rallies for him, wrote and circulated a letter of support among elected officials and even met with Columbia’s president over his future. Despite Rodriguez’s help, Pena-Mora eventually resigned as a dean in July 2012 after a majority of the school’s tenured professors cast a vote of no confidence in him. However, he was allowed to keep his teaching gig and remain in faculty housing. In April 2014, de Blasio, with Rodriguez by his side, announced the appointment of Pena-Mora as the commissioner of DDC, which oversees the building and renovation of city-owned facilities. Rodriguez's chief of staff, Carmen De La Rosa, said his wife, Cristina Melendez, did not get her job at the DDC through cronyism. De La Rosa said Melendez holds a bachelor's degree in public policy and two master's degrees in education from Columbia's Teachers College — and those credentials were key to her job at the DDC. During her 11 months there, she helped run a program where the agency used its expertise in math and engineering to inspire Bronx middle school students, De La Rosa said. "Ms. Melendez has been eminently qualified for every position in which she has served within city government," De La Rosa said. "For anyone to question the abilities or qualifications of Ms. Melendez is not only an affront to those who choose to enter public service generally but a cheap shot at a hardworking mother and educator who serves our city's children day in and day out. Suggesting otherwise is a dirty move aimed solely at her husband, a well respected elected official with a longstanding record of integrity and service to his constituents." De La Rosa did not say why Melendez left the DDC, but she now works as a director of school renewal at the city Department of Education, earning $130,621, according to city records. Prior to taking the DDC position, she worked for a year as an assistant principal at Gregorio Luperon High School for Science and Mathematics, which Rodriguez helped to found and where he was once a teacher. Her salary was $102,067. Before her assistant principal position, she worked as a teacher and later as an achievement coach who supported Luperon and other schools. The Conflict of Interest Board rules prohibit city employees from hiring close family relatives or business associates. The law doesn’t prohibit hiring friends. The Conflict of Interest Board said it is not allowed to reveal whether a city employee sought its advice over a potential conflict, only whether it has public documents related to the particular person or matter. The agency said in this instance it had no public documents. The state Attorney General's Office investigated the allegations but found no criminal wrongdoing, according to a source. De Blasio’s office did not respond to a request for comment.